Buy all three DVDs now and save $$! Little River Railroad #110 / Celebrating 100 Years - Little River Railroad in Coldwater, Michigan threw an impressive three-day party for their 100 year old locomotive. Three visiting tank engines, Viscose Company #6, Flagg Coal #75, and (making its debut) Lehigh Valley Coal #126 were the guests of honor. Little River Railroad #1, also a tank engine, made for a total of five steam engines. The first two days featured four daily trips between Coldwater and Quincy each pulled by one of the tank engines, and a longer trip to Hillsdale, Michigan pulled by #110. On the third day, all five engines teamed up to power two spectacular Quincy trips. We cover it all! 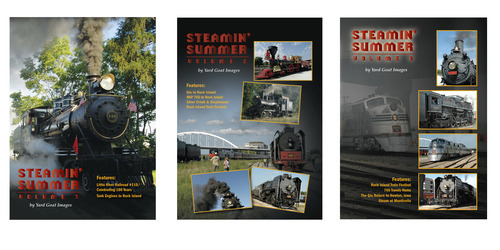 Tank Engines to Rock Island - following their visit to Little River Railroad, all three visiting tank engines needed to go to the four-day Rock Island Train Festival. This programs shows how the engines are carefully loaded on special trucks and shipped as heavy loads over the highway. DVD - Steamin' Summer Volume 1 - Yard Goat Images from Yard Goat Images on Vimeo.